A while back I did a study of major market tops for Quantifiable Edges Gold & Silver subscribers. The study goes back to 1970 and considers every SPX top that was followed by a decline of at least 20%. I identified two indicators that I found especially useful in determining when conditions may be ripe for a possible top. I recently updated the QE Study of Tops, and received a lot of positive feedback on it. A primary reason that I was inspired to update the study is that one of the indicators is currently flashing a warning sign. So I decided I would also make the study available to non-subscribers for a small fee. The Study of Tops can now be purchased on the Quantifiable Edges website for $5.99. If you purchase a Quantifiable Edges subscription within two weeks of your Study of Tops purchase, your $5.99 will be refunded. I certainly hope everyone finds it interesting and valuable. If you purchase it and don't feel it was worth the $5.99, then simply send me a note explaining why (relatively nicely), and I will refund your money. Lastly, I also included a coupon (good through March 31) for a free trial of any Overnight Edges subscription as part of the Study of Tops. You may purchase the Quantifiable Edges Study of Tops by clicking here. On Monday the bulls tried to make a move higher and failed, making for a higher high and a lower close. On Tuesday the opposite happened with a lower low and a higher close signifying a failure by the bears. This action triggered the below study in the Quantifinder. It was last seen in the 3/3/11 Subscriber Letter. I have updated the results. Odds across the board, from Win % to Win/Loss Ratio and Profit Factor are all impressive, and suggestive of a short-term upside edge. Monday saw some unusually strong action. One index that showed a real extreme move was the VIX. It spiked up 34% as fear struck options traders. 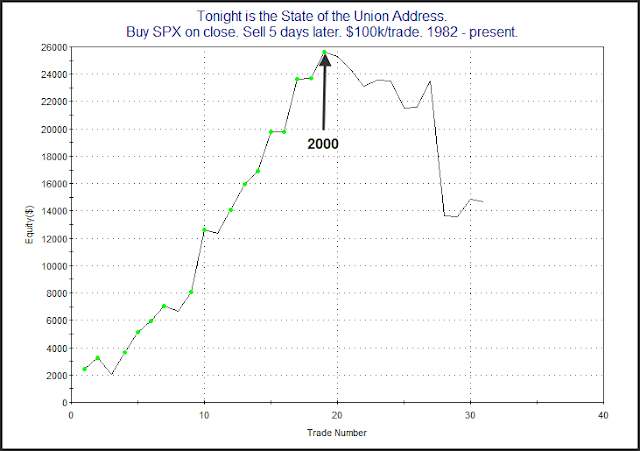 In the past I have shown how 1-day spikes of 20% or greater have generally suggested an upside edge. I’ve rerun that study tonight. I did also look at moves of greater than 25% and 30%, but that did little to change the odds and just made instances fewer. So I simply stuck with the old 20% parameter for the study below. Next day stats suggest a solid upside tendency. 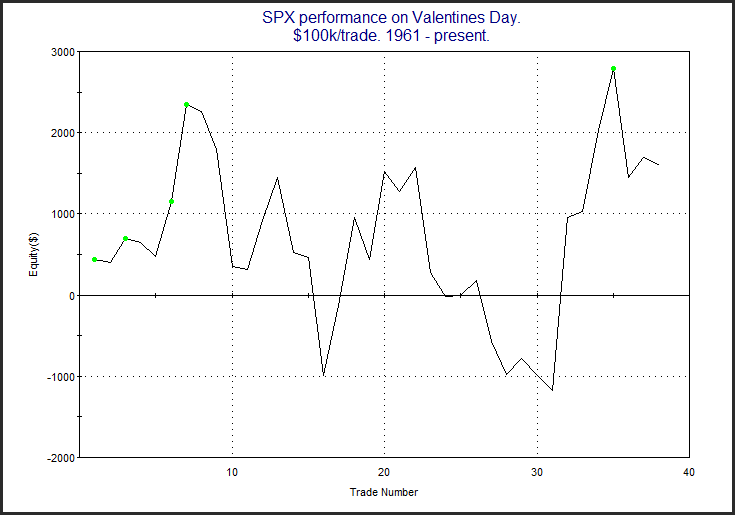 I would also note that the size of both the “Avg Winning” and “Avg Losing” trading is quite large for a 1-day move. So regardless of whether the market moves higher or lower, we could see some strong action today. I am starting to see more evidence pointing towards a bounce. The pullback over the last couple of days, while not large based on historical standards, has been relatively sharp compared to recent action. Relatively sharp pullbacks from intermediate-term highs have had a tendency to bounce over years. This is exemplified in the study below. The stats all suggest an upside edge over the next 1-4 days. Short-term evidence I am currently looking at is mixed with both bullish and bearish studies triggering. The study below is one that favors the bearish case. It examines SPY performance after posting an unfilled gap down from a high level immediately after an unfilled gap up. Instances are a bit low, but the consistency and magnitude of the moves lower are strong. I found this study compelling enough to take under consideration. The study below looks at SPX performance on Valentine’s Day over the years. If Valentine’s fell on a weekend, it was not counted. Valentine’s performance is like young love. It can be fickle. Happy Valentine’s Day to all you lovers out there! After closing at a new high on Friday, SPY reversed so hard on Monday that it closed at a 7-day low. Way back in the 6/19/09 blog I looked at 1-day moves from a 7-day high to a 7-day low. I have updated those results below and also incorporated a 200-day moving average filter. There appears to be a bit of a downside edge over the next few days, and much of that edge has played out during days one and two. Perhaps the quick move through 7 days of resistance causes weak hands to bail and further selling to ensue. It will be interesting to see how it plays out today because it appears SPY may have a large gap up when the market opens in about an hour. Gaps up from low areas are less likely to fill, leaving shorts stuck and chasing the markets upwards. If the gap can hold, then we may avoid the further selling suggested by the study. If the gap up fills, then the move lower could quickly accelerate.